Cast your name in concrete with precast concrete signs by Wausau Tile's Terra-Form Division. Providing long-term durability, low-maintenance and vandal-resistant products, Terra-Form offers a wide variety of shapes, sizes and finishes. Custom signs are a specialty, and with 50 years of experience and a team of designers and craftsman, Wausau Tile can make your design concept a reality. A fleet of crane-equipped trucks can provide delivery and placement service in one package. One of the strongest and easiest ways to generate revenue for your facility is through corporate sponsorship and advertising. 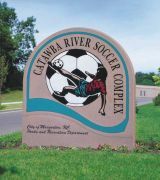 The Rotating Indoor/Outdoor Fascia Signs from SignCo offer every managed recreation facility a tremendous opportunity to generate revenue. With each sign capable of holding up to 20 ad panels, you can offer all your advertisers the prime location from within your facility or ball field. Commemorate athletes, enhance your facilities or promote a special event with custom banners by Olympus Flag & Banner. 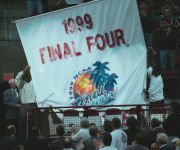 Whether it's championship and appearance banners, commemorative banners, hand-held flags, or street banners of any shape or size, Olympus can custom-produce it. Olympus specializes in traditional screen-printing, digital printing and appliqué services. Choose from a wide variety of materials. There are no minimums. Olympus has been serving the industry for more than 100 years, providing sports and fitness facilities with eye-catching designs and quality products. The Enviropoly signs by Envirosigns are popular with recreation facility maintenance crews because of their superior durability and vandal-resistance. They are enjoyed by the general public because of their aesthetic appearance. Administrators recommend them because, unlike metal signs, they don't have sharp corners, limiting liability concerns. The ColorlockTM system gives you the opportunity to add your full-color logo or wayfinding map to your sign, as the City of Atlanta did in its sign for the Oakland City Park Swimming Pool. 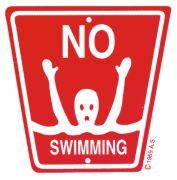 A ©No Swimming Symbol Sign can help protect against tragic drowning accidents. They provide a clear and profound warning against swimming where the signs are posted, while creating a danger-identity mental image for constant self-control against swimming in any unauthorized swimming area. Designed "through the eyes of children," the signs' unique graphic design enables all ages to understand, respond to and retain the message. Optional overlays and hazard plaques are also available to warn against water activities other than swimming and spell out known water hazards. As the official sign provider for some of the nation's largest associations and a leader in institutional signs, Stewart Signs meets the highest standards of quality and design. Your image and the reputation of Stewart Signs depend on it. Because of volume of sales, Stewart buys in large quantities, manufactures to rigid specifications and maintains consistent superior workmanship. Because of this, Stewart can produce high-quality products at reasonable prices, making the signs a great value. You can choose changeable copy and electronic message centers with graffiti-resistant finishes, vandal covers and a lifetime warranty. 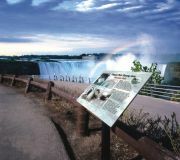 Fossil Industries manufactures digital High Pressure Laminate signs and murals that are guaranteed for 20 years against fading and weather deterioration. Fossil signs are impervious to moisture, can never delaminate or crack, and are extremely resistant to UV rays, scratching, impact, cigarette burns and graffiti. Many state and national parks use Fossil signs. Available in any shape, the signs do not require framing and can be easily attached to pedestals, posts, railings and walls. Fossil offers a complete line of supports as well as graphic design services. Changeable Copy Banners are an economical solution to your on-premise signage needs. Their innovative design allows you to change messages over and over in just a matter of minutes. Build-A-Banners are available in a wide variety of sizes and colors. They feature heavy-duty, double-stitched vinyl and strong nylon rope sewn in both the top and bottom for extra reinforcement. Durable 20-gauge plastic pockets with flaps keep out water and keep your Build-A-Banner looking its best.